Nice movement and patience vs that OSU zone by Dedric. That was an awful possession by the #KUbball offense. No purpose. No attack. Just letting that 1-3-1 OSU zone dictate what they did. One possession later, Moore should have made the extra pass to get Agbaji a 3-pointer from the left wing. Damn good challenge by Mitch Lightfoot and hell of an attack by Cameron McGriff. #KUBBALL has 2 bigs in foul trouble. If you're 6'9" or taller - please check in at the KU basketball offices at halftime. With 4:22 left in the first half, Charlie Moore hits a floater. It is the first #KUbball basket not made by either Ochai Agbaji, Devon Dotson or Dedric Lawson. I wonder how many people in here know the name of the Okie State coach? Better yet - I wonder how many Okie State fans know his name? Under-4 timeout at AFH 1st half. #KUbball leads Oklahoma State 28-24. Both teams shooting right about 45 percent. Lightfoot giving KU a big energy lift in terms of grit and toughness. Charlie Moore now 0 for 3 on 3-pointers. Only Devon Dotson has more shot attempts than Charlie Moore. Agbaji now 3 of 4 from deep with a couple of timely makes in the last couple of minutes. Knowing where their shooters are would be a good idea. It's literally all they can do. HALFTIME at AFH... #KUbball and OSU are tied at 36. 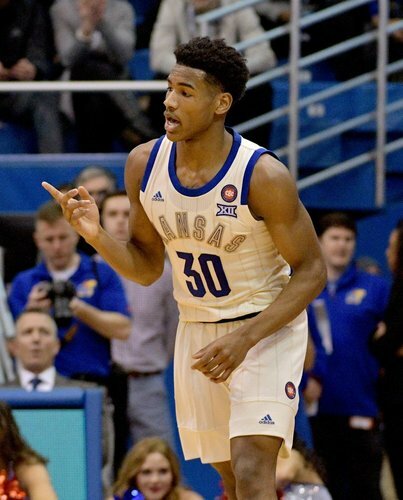 Ochai Agbaji had 15 points, including 3 of 4 3-point tries, or else KU would be in much worse shape. Here's the complete list... For perspective, #KUbball is No. 18 in the NET Ratings, which makes this a more than favorable seeding. A couple of freshman guards carrying KU offense early. Agbaji with 15 points, Dotson with 10. 4 freshmen started today for #KUbball . Tied at 36 with OSU at half. A knockout game is currently being played at halftime. Josh wins free pizza for a year from Pizza Hut. This would be a much better prize if it were free pizza for a year at 2 in the morning from Pizza Shuttle. Will Smith currently being played. Lightfoot in place of McCormack to start the 2nd half... Here we go. #KUbball and OSU tied at 36. 20 minutes to go. Ochai: Hey you going to the mall later? The worst poster attempt in the history of poster attempts.